BERA > Publications > The BERA/SAGE Handbook of Educational Research. Providing a comprehensive account of education research today, SAGE Publishing launches The BERA/SAGE Handbook of Educational Research. The Handbook provides a comprehensive guide for researchers, both new and existing, as well as a resource to prompt further thinking about broader issues within education research. In particular, the book is a cutting edge account showcasing education as an academic discipline. The key questions that the book addresses are: what is education research? ; as well as what does it mean to be an education researcher as we approach the 2020s? The book is published in two volumes, benefitting from the contribution of over 50 leading academics to the six parts of the text: Understanding Research, Planning Research, Approaches to Research, Acquiring Data, Analyzing Data and Reporting, Disseminating and Evaluating Research. The text is edited by Dominic Wyse, a Professor of Early Childhood and Primary Education at UCL Institute of Education (IOE), Neil Selwyn, a Professor in the Faculty of Education, Monash University, Emma Smith, a Professor of Education at the University of Leicester, and Larry Suter, a visiting scholar at the University of Michigan. The publication of this Handbook is the next step in a collaborative history between BERA and SAGE to support researchers in education. 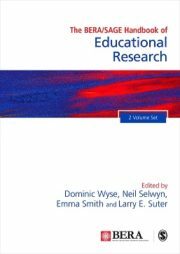 In 2012 SAGE began publishing Research Methods in Education in association with BERA, a series of six books mapping the territory of key research approaches and topics. For over eight years, SAGE has also supported BERA’s awards for early career researchers and practitioners, and 2016 marked the second year of the BERA/ SAGE Public Impact Award to support and encourage excellence in the application of research in practice. Find out more about the Handbook here and read a preview here. A FREE 30-day online trial of SAGE Knowledge, including access to The BERA/SAGE Handbook of Educational Research, is available by emailing librarysales@sagepub.co.uk.